If there was such thing as luxurious warmth in a calf-jacket you’ve just found it. Three layers of protection, including 3M THINSULATE technology, will keep calves warm during the colder months. A sturdy buckle vs. velcro will keep the blanket secure without getting gooked up with manure and straw. While calf blanket use varies depending on your location, climate, and management practices, the following information will provide you with valuable tips on: How and why to use calf blankets, How to care for calf blankets, and How to choose the best calf blankets. Why use a calf blanket? Calf blankets, also referred to calf coats or calf jackets, are a cost effective tool that helps prevent cold stress in calves. Calves have a temperature range where they are considered to be comfortable, known as the “thermoneutral zone”. For a newborn Holstein calf, this zone is between 50 and 78°F (10 to 25°C). If a calf’s temperature goes above or below these temperatures, the calf will divert its energy from growth and immune function towards maintaining its core body temperature. How to properly use a calf blanket? • Blankets are highly recommended on newborn calves up to three weeks of age and for calves suffering from illnesses. – A popular rule of thumb: “If the calf is less than 3 weeks old and the ground is frozen, use a blanket”. • First, make sure the calf has good clean bedding. In the first few weeks, newborn calves spend most of the time lying down. If the bedding is dry and thick enough, it will provide a comfortable “nest” for the calf to lay and shelter itself from the cold in. If there isn’t enough bedding, or the bedding is wet, the calf may prefer to stand, which exposes the calf to the wind. • Clean and dry hair coats provide greater insulation from heat loss, so the calf’s natural hair coat should be clean and dry before putting on a blanket. Newborn calves should have time to dry before being moved to an outdoor hutch. As the temperature drops, any moisture trapped under the blanket will cause the calf’s body temperature to also lower. 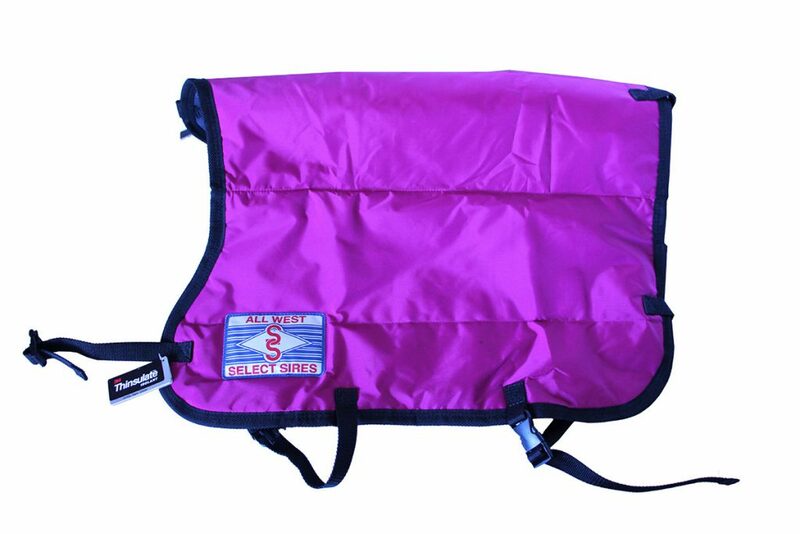 • Ensure calves are not sweating while wearing calf blankets during the day. Again, as temperatures drop the moisture will cause a decrease in the calf’s temperature. • The blanket should be snug, not tight. We recommend just loose enough to slide your hand under the blanket. How to maintain and care for a calf blanket? • Blankets should be regularly machine washed and dried. Proper cleaning will reduce the spread of bacteria and is good for the insulation. Most calf blankets use one form of insulation or another. Regardless of what type, the properties of insulation are the same. – Insulation works by trapping air molecules between you and the outside air. The more air the insulation is able to trap, the better the insulation will be. If the blanket is compacted with soiled material, then the insulation will not work properly. – Machine washing does not markedly affect the performance of Thinsulate insulation used in Calf-Tel Calf Blankets. Tests have shown that Thinsulate insulation remains relatively unchanged even after repeated cleanings. • Calf blankets should be stored in a clean dry location ready for use. How to choose the best calf blanket for you? There are many types of blankets to choose from. Here are some of the key factors to consider when choosing the best calf blanket for you and your calves. – Straps should be long enough to allow for use on large and small calves as they grow. – Most blankets use either Velcro or plastic buckle fasteners. – Velcro is cost effective, but can become clogged and matted with debris. – Plastic buckles add cost, but they ensure a secure fastening and are long lasting. • Material: Calf blankets are used in harsh conditions and should be durable enough to withstand normal day-to-day conditions and multiple washings. You want a dry blanket on a calf, not a wet one, so a water repellent material is best. • Insulation: Insulation is what keeps the calf warm. Calf blankets should be properly insulated with material that is washable and durable. • There are typically two sizes of blankets, large or small.